Oil on canvas, signed lower left. 25" x 30" and approx. 32" x 37" in the repro. frame. 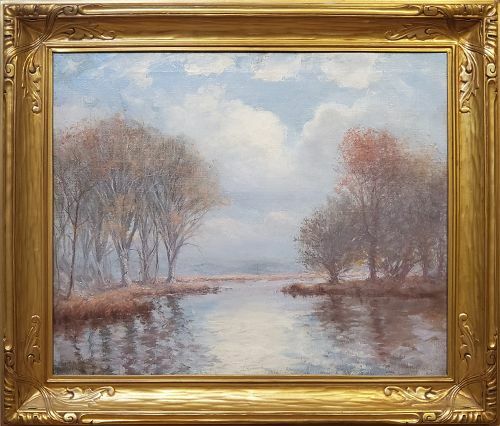 Bio from askart.com: Robinson (1875-1933) painted at Old Lyme and exhibited After a Spring Rain, After the October Storm, The Last Glow, Saw Mill River and The Ice-Bound Hudson between 1909 and 1911 at the National Academy of Design. At the Corcoran Gallery he showed After a Spring Rain in 1910. In the following year he exhibited A Gray Day in November and The Ice Pond after a Thaw at the Carnegie International. Basically a naturalistic landscape painter, Robinson shows a degree of assimilation to impressionism in his use of violet hues and in the expressive application of impasto pigment. He obviously worked from a fully loaded brush that results in a textural impasto that is a delight in itself, yet there is no systematic use of broken color, as Childe Hassam practiced. Hassam’s arrival at Old Lyme in 1903, along with that of Willard Metcalf, changed the orientation of the artists’ colony almost completely from tonalism to impressionism. Robinson was obviously responding to those innovations. When Robinson died in 1933, the Lyme Art Association was undergoing financial problems. Florence Griswold would live until 1937, guiding visitors through her colonial house. But largely the Griswold Mansion had become a nostalgic curiosity. On the other hand, Old Lyme remained the choice of many landscape painters, and into the early 1960s, Will Howe Foote (1874-1965), William Chadwick (1879-1962), Guy Wiggins (1883-1962), and Harry Hoffman (1874-1966) were still exhibiting there.